Enjoy free shipping when you purchase 3 Clipas. Click link to start shopping. 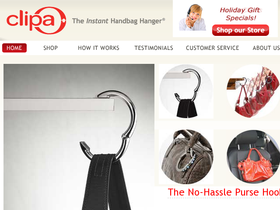 Get your Clipa for your handbag starting at only $19.99 from Clipa.us. Click link to shop. Buy a pink Clipa to help support the fight against Breast Cancer. 10% of the purchase goes to BCRF. Click link to see.